Saari arrives to PINKFONG TV. 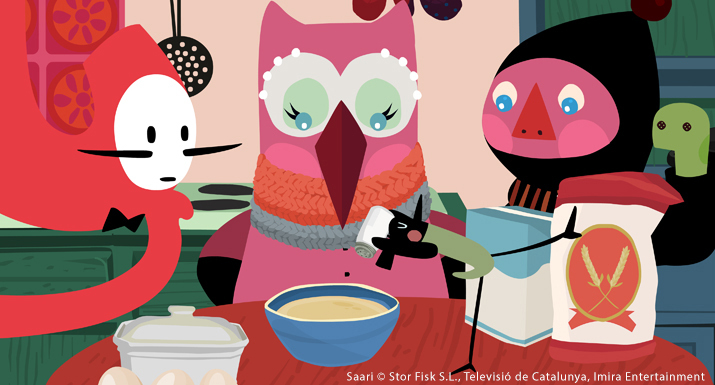 Pikkukala has signed a distribution deal for the animated series “Saari” with Smartstudy, for their SVOD platform PINKFONG TV. Saari is an animated series narrating the musical adventures of four friends in an island. Produced by Stor Fisk in co-production with Televisió de Catalunya and Imira Entertainment. Created by Finnish author Veronica Lassenius, Saari is a fun, beautiful world, with a rich Nature, inspired by the Finnish summer. The series has been distributed in about 20 Territories already. PINKFONG TV is the leading mobile SVOD platform for kids not only in Korea but also in Asia, as one of the PINKFONG app series with over 7 million monthly active users. “We are extremely happy about this collaboration with Smartstudy to bring Saari to Korea”, comments Pablo Jordi, CEO Pikkukala, “ It is a privilege to work with a leading actor like them in establishing the Saari brand in Asia”. After the launch of our SaariTV in 2013 and Saari Pairs last year, this is one step further in Pikkukala’s strategy to digitalise the Saari Brand. “Korea is an exciting market for us because of the country’s tradition in the game, character and animation industries and its links to other Asian territories”. Pikkukala Oy is an entertainment studio based in Helsinki. It focuses on the production, distribution and licensing of children’s content in all the formats. Saari is programmed to premiere on PINKFONG TV in September. http://pikkukala.com/blog/wp-content/uploads/2015/08/FRONT_02.jpg 385 715 Pablo Jordi http://pikkukala.com/blog/wp-content/uploads/2015/01/logoheader_small.png Pablo Jordi2015-08-11 06:43:592015-08-12 13:34:59Saari arrives to PINKFONG TV. Pikkukala in MIFA 2015 “Saari Tales” a new storybook game for mobile devices.